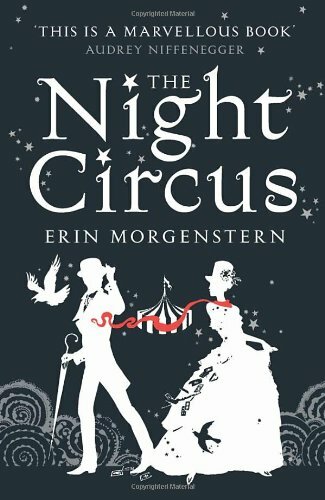 Bex from An Armchair by the Sea sent me this as part of her self-imposed campaign to make everybody in the entire world read The Night Circus. But hey, it’s a worthy cause because this book is amazing. I know there are already a million and four reviews talking about how pretty the book is, but just for continuity’s sake… it is really pretty. I’m not usually a fan of coloured page edges, but it just kind of works here. Combine that with the silhouetted illustrations and a shiny jacket covering a dark red hardback and the result is a book I want to store in an airtight room under MI5-level security to preserve it forever. It’s the atmosphere that does it, I think. That’s what makes it so compelling, so addictive, so… wonderful. I’ve never read anything like it. There is a plot, and a fairly fast-paced one at that, but it would be nothing without the beautifully descriptive prose of Erin Morganstern. Inserted between between every few chapters is a page written in the second person, detailing your visit to the circus – I swear you can really see/smell/hear the infamous black and white circus swirling around you. The relationships featured are just as wonderful as the setting – Celia and Marco, Celia and her father, Bailey and Poppet… Each relationship is built differently but with just the same care and consideration for detail. There’s no insta-anything. It’s easy to see the foundation for every single one and they all seem as real and feasible as the last. I particularly liked how Celia slowly grows away from her father – she gradually learns to stand on her own two feet and make her own decisions, and it’s wonderful to see her progress. I do think the ending was lacking something, but I’m not sure what. A bit of ‘oomph’ maybe. It just seemed to drift on a little longer than perhaps it should. I’m just not sure it really need the bit of housekeeping that went on afterwards. I haven’t read a book in a long time that’s so close to being perfect. Erin Morganstern has a talent for manipulating prose that will never be surpassed. I freely admit that I’m a completionist reader – I take a small amount of pleasure from having finished books – but even I wanted to savour every word of The Night Circus. I purposefully read it at the end of 2011 so I could pick it up again in 2012, and I will definitely be doing so. I thought this book was magical. I guess it was the great description of being in a circus. Who doesn't want to live in this world? @Bex – You're right. Usually I hate comparing books to Harry Potter because it's rare I actually see a novel without 'HP FOR GROWN-UPS!' plastered all over it but I see your point here. Not that they're similar, but the realism of the new, shiny worlds. It's weird, I haven't seen any other review mention the lacklustre ending but it probably shouldn't surprise me that we felt the same 😛 It didn't ruin the book for me or anything, but I just think it kind of fizzled out? @LIB – It is. Sorry. Haha, I don't know where I asked it either, but I know I did! Buy it. Buy it. Buy it. Have I ever steered you wrong? 😀 I ended up taking the jacket off the preserve the beauty and I NEVER do that. Great book. Magic, suspense, takes you to places you never imagined. A wonderful new author and I hope many new books to come.